New guidance was published by the Department for Work and Pensions (DWP) on 23rd February 2017 and has been updated in April 2017. It answers the following questions put to DWP by people with experience of volunteering and claiming benefits. It is designed to be clear, simple and concise. Can I volunteer while receiving benefits? Am I allowed to claim expenses for volunteering? Why do I have to tell DWP about my volunteering? How do I inform my benefit office about volunteering and what information do I need to provide? How could volunteering affect my benefits? Will getting involved in volunteering be viewed as a change in my capacity to work? Will volunteering make me ‘fit for work’ even if I’m on a health related benefit/conditionality? Can the Jobcentre Plus make me to volunteer? If I am volunteering and I’m offered a job interview or a job, what should I do? Please note: You can request a VOLW1 form at your local jobcentre so that you can tell DWP about your planned/existing volunteering activities. Alternatively you can complete a VOLW1 with your work coach. If you wish to speak with someone in confidence about volunteering and benefits, contact one of our advisers at Volunteer Glasgow. If you’d like to know more about how we worked with a range of partners and stakeholders to help DWP produce this new guidance, please see the news items below. 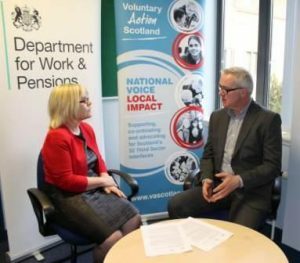 We will be continuing to work with DWP Scotland, Voluntary Action Scotland and Glasgow's Poverty Leadership Panel to ensure the guidance is widely disseminated and applied consistently. Please tell us what you think - and tell us about any examples where you think it hasn't been applied correctly - so that we can feed this into the work and into future updates. Please tell us your email address if you would like a reply.